“Thomas Middleditch Wears an Enigmatic Sweatshirt and Sweatpants with Pockets” is a funny episode of sketch comedy. There’s no doubt there. 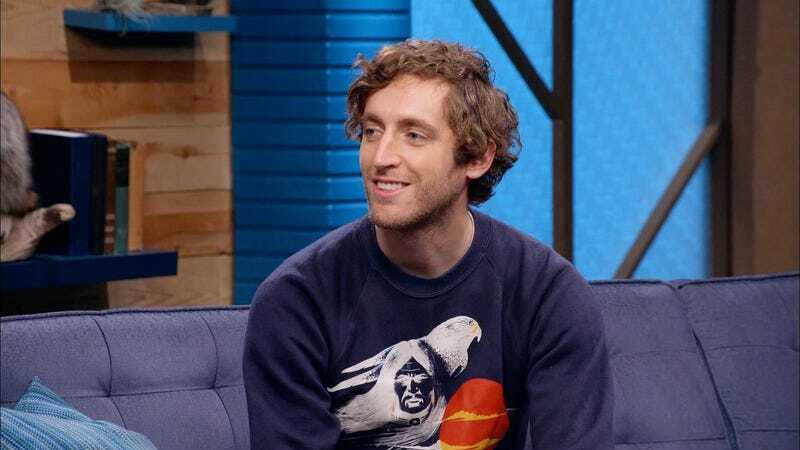 Thomas Middleditch, the breakout star of Silicon Valley, brings his awkward charm to the blue couch in the same week David Letterman, a clear influence on Aukerman, put in his final show. It’s hard not to compare Bang! Bang! with early Letterman, especially in terms of tone and point of view. Aukerman’s character on Bang! Bang! is wide-eyed and sarcastic, a childlike homage of Letterman’s cranky old man. The most absurd Bang! Bang! bits borrow heavily from Late Show classics like “Know Your Cuts Of Meat” and “Beat The Clock.” Watts is a mellow Shaffer minus the sunglasses (but keeping the keyboard). It makes “Thomas Middleditch Wears an Enigmatic Sweatshirt and Sweatpants with Pockets” an excellent love letter to an important influence. Teen superstar Brody South Dakotee serves as the frame story for the episode. Scott has been surreptitiously doubling as Brody for admittedly unknown reasons (“No one’s making me do this!”). But as decreed by tween television tropes, he must keep up a separate persona as cool teen Brody South Dakotee. The fake show intro has some wonderfully self-aware lines (“This is a lot like Hannah Montana”). Bang! Bang! doesn’t dive as deep as it normally does here, but the callback to Darren Schlepping, Dirty Little Weasels creator from “Simon Helberg Wears a Sky Blue Button Down Jeans”, was gratifying. At the beginning of the episode, a small studio audience is set up on bleachers just off-set. Evidently there’s always a studio audience, they just haven’t laughed. At anything. Ever. I’m praying for a callback to this at some point. 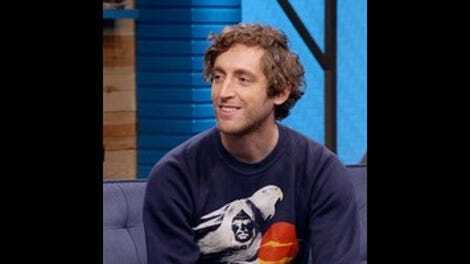 For “Thomas Middleditch Wears an Enigmatic Sweatshirt and Sweatpants with Pockets,” the audience is mostly made up of South Dakotee’s friends, there for Aukerman’s interview with Brody. The problem, of course, is that Brody is Aukerman. Hijinks obviously ensue. Middleditch won me over on Silicon Valley and then stole my nerd heart over on his Twitch channel. He performs admirably here, better even than some of his more experienced peers. The accent game is a thing of beauty, with a pretentious Middleditch requiring a precise address to get the correct intonation. “Who knew they would be that different?” Aukerman asks. “I did,” an incredulous Middleditch responds. The fluidity of these bits help each one elevate the other. The accent game goes right into a roundabout way to discovering Aukerman’s origin story, which includes a very early double murder by way of umbilical cord. This all comes about after Aukerman doesn’t get an airplane exit row joke. It feels improvised and there’s a certain thrill in watching that happen. Every tween television star needs an album and Brody South Dakotee has a great one, “Songs That Prove I’m A Teenager.” I love that this is both a play on the episode’s double identity plot and a riff on the fact that middle-aged Aukerman could easily pass as a college freshman. The album contains all the greatest hits, from “I’m Too Young To Remember 9/11” to “My Back Always Feels Fine.” A finely crafted skit. Harmony Moonglass, Orange Is The New Black’s Lauren Lapkus, leads some guided meditation. Even though the jokes are pretty obvious (she keeps asking questions, Aukerman keeps answering, she keeps getting mad), the skit takes a smart left turn towards the end. Lapkus is great and I really liked watching the three bounce off each other, Middleditch especially. His contorted physical comedy adds a layer of spice to the sketch. The episode wraps up with a conclusion to the frame story. The meddling kids rummage through Brody’s backpack, but only find red herrings: Aukerman’s credit card and mortgage statement. Not enough to prove that Brody is Aukerman, obviously. But then they discover the smoking gun: diarrhea medicine, Brody’s alibi whenever he bails on them. After interviewing Brody’s arm from behind the wall, Aukerman accidentally drops Brody’s signature catch phrase, “Cooler than Tony Hawk in a freezer.” With the catchphrase, the backpack, and the diarrhea, Aukerman’s gig is up. He reveals his ruse and his fear that they won’t be friends with him if he’s just Scott Aukerman. He’s right, but for the wrong reasons. They just plain don’t like him. At all. It’s the type of self-depreciation that would make Mr. Letterman proud. I don’t think there’s a joke, but there really is a 2551 Hillcrest Rd. in Mobile, Alabama (Hillcrest is on the west side of the city). Amount of floors is unclear.